Receiving a text message at 4:15 am in Norfolk Island from my eldest son in Christchurch saying “massive earthquake” was the shocking start to my last day on the island (though fortunately my home was not damaged). I had just spent a week tutoring a series of flax weaving workshops, and spending time with local weavers, at the invitation of Norfolk Island’s Creative Arts community, and was heading home that day with the generous gift of a Norfolk Island hat, woven with Pitcairn Island pandanus by Wayne Boniface. Norfolk Island has a strong creative arts community including a Wearable Art Show. The entry pictured here is a creation made out of drain flax (bulrushes) by Wayne who explained how the design changed as he wove it and evolved into this lovely tropical, summery outfit. It was interesting to weave in Norfolk Island because there were new weaving materials with different properties to try. 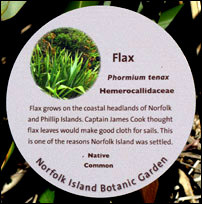 Even Norfolk Island Phormium tenax is quite different from the Phormium tenax flax we have in New Zealand. I found it to be much more like Phormium cookianum. The leaves are short, wide, soft and brittle, and have very little fibre content, although this didn’t greatly affect the workshops I took, as the pieces people were weaving didn’t require strong fibre. Although flax grows abundantly in Norfolk Island, it’s not generally used as a weaving material, as the traditional weaving is done with pandanus — a tradition that originated from the original Pitcairn Island settlers. Kentia Palms also grow abundantly on Norfolk Island and so I was able to experience weaving with a palm leaf for the first time. I cut a complete leaf off a tree and then used one section with ten leaflets each side of the rib to weave a large two-cornered basket. The leaflets were soft and easy to weave, and are quite wide, and so it took only a few minutes to weave up both sides of the leaf, from the rib upwards, and then weave the corners and finish the top. I used some of the left-over ends coming out of the top to plait a handle up both sides. It’s easy to see why palm frond baskets are used in other islands in the Pacific for everyday use as it’s so quick and easy to weave a large basket. Another weaving material that is traditional to Norfolk Island, and one I particularly liked because of its mottled brown markings, is rahooloo or banana bark. The bark is easily stripped off the trunk of the tree because the trunk tends to shed its bark anyway. Once the bark is stripped off it is plaited into long strips in preparation for weaving a hat or a basket. I wove a two-cornered basket which I was able to bring through New Zealand Customs as it was quite dry. 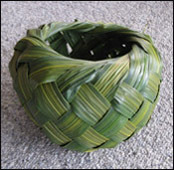 The Norfolk Island weavers also make use of packaging strapping to weave utility baskets, like the ones pictured here, woven by Wayne Boniface. These baskets are woven around a wooden form. The strips are nailed to the bottom of the form to hold them in place and then woven with a vertical/horizontal style of weaving. The handles are made with a four-plait cord, and the ends of the cords are woven into the body on the outside of the basket to create a decorative pattern. These baskets are for everyday use and are ideal when collecting shellfish, as the excess water can escape through the gaps between the waterproof strips. If you are planning a trip to Norfolk Island and would like to meet some weavers, visit the Golden Orb Bookshop and Cafe on a Wednesday. There you’ll be able to see a group of weavers making traditional Norfolk Island hats and have the opportunity to purchase one for yourself. The welcome and friendliness I received in Norfolk Island made tutoring the workshops very enjoyable as we all shared tips and ideas for weaving. Although pandanus will no doubt continue to be the most popular weaving material in Norfolk Island, I am hopeful that flax will start to be used a bit more as weavers become accustomed to the different weaving properties it has. © Alison Marion Brown 2010. Thankyou Ali for running the weaving workshop on Norfolk Island. Your workshop was so enjoyable and has shown us how to get the best out of a new material Flax which I have used very little, will now keep playing with it and hopefully my baskets will hold smaller objects one day soon! I do like the little round bowl. The little round bowl is my favorite- shame you couldn’t bring it home-reminds me of my trip down South when I had to leave my woven kelp basket I made behind. I have visited Norfolk and admired their weaving tecniques. You could always come and visit us up North if you want to play with Banana fibre - Lots of Nikaus and palms as well. A useful tip for next time you are overseas…..it worked for me on my return from Fiji with a woven hat…..put the item in your wash hand basin, pour boiling water over it, soak 10 mins then dry in the sun. Repeat this on the next 2 days and then tell MAF what you have done on your return into the country. Worth a try! Floral Focus went to the printer this week, will keep you posted re your lovely angel! It was wonderful to meet you on Norfolk Ali, and thankyou so much for your advice and information regarding our piece of Second Settlement, convict made cloth. I haven’t been able to get anyone interested in taking up the research in Sydney yet - but there will be an interesting story to tell out of it all. Best wishes. Raewyn - Glad you enjoyed the workshops - I did too. Carrie - The bowl is an attractive design isn’t it? I’m looking forward to getting time to try weaving one with flax. Dot - I hope to get up north some time and look forward to being able to use the materials up there. Janthia - Thanks for the good tips about preparing material before bringing it into NZ. I’ll certainly remember that next time. I’ve also since heard that you can put it into the freezer for around 24 hours which I assume will kill the bugs. Lisa - I enjoyed the discovery we went through with the cloth that was on display in the museum. It was most interesting. I do hope someone takes up the opportunity to do the research of weaving flax cloth during the second convict settlement in Norfolk. I think there’s another interesting story there. love everything all of you are doing. and hope to meet you all at this next one. Thanks for getting in touch. Your website is very interesting and you have a wealth of informative photos on it. I enjoyed looking at all the different workshops and the way different materials are used too. Unfortunately one of the communities that I particularly wanted to see was the one on Torres Strait but the link doesn’t work at present. hey i really admire the little palm leaf bowl. would you happen to have any instructions? I don’t currently have instructions for the bowl. It is based on a bowl made in the Pacific Islands and I found the instructions in a book about palm weaving.